A very aromatic perennial herb which grows from 30 to 90cm high. These specimens somewhat wind-blown. 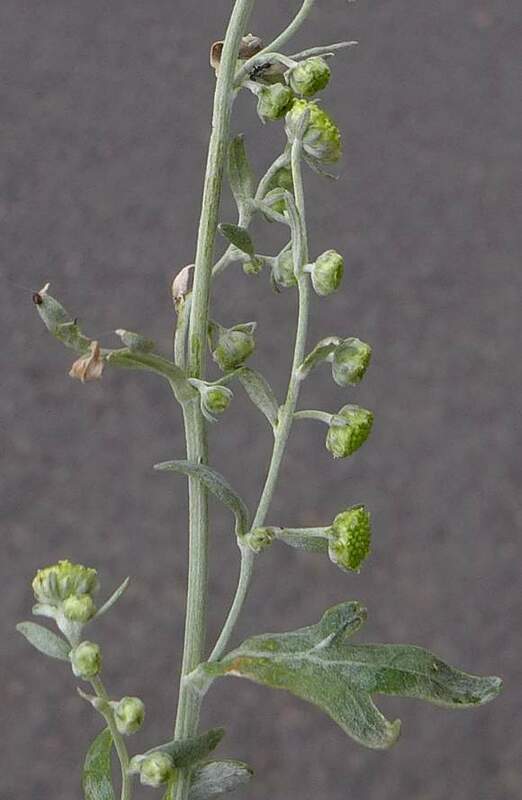 The flowers are on the upper half of the plant looking pale yellow en-masse. The lower part of the white-hairy stems has lobed leaves. The top half of a flowering stem (not all of it). 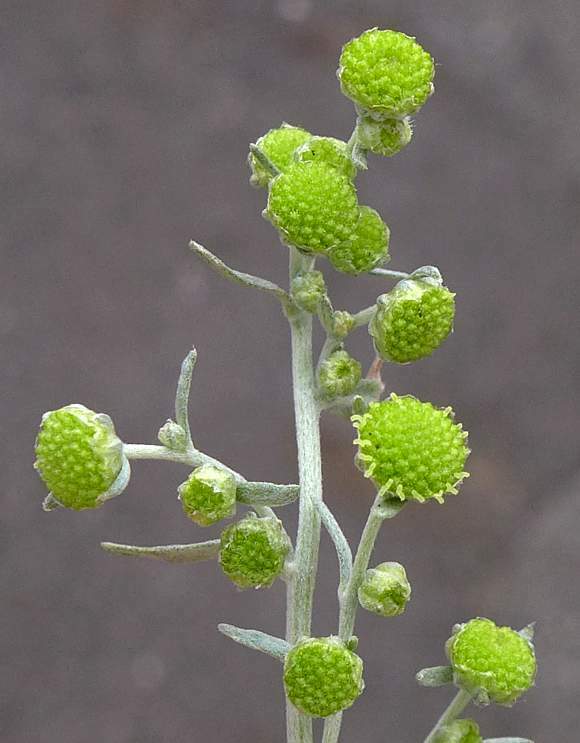 Everything apart from the inflorescence itself is covered in matted white hairs flattened to the surfaces. Most bracts up here are linear. Compound inflorescences on shortish curved stalks, most flfacing slightly down or horizontal; the more rescent upwards. 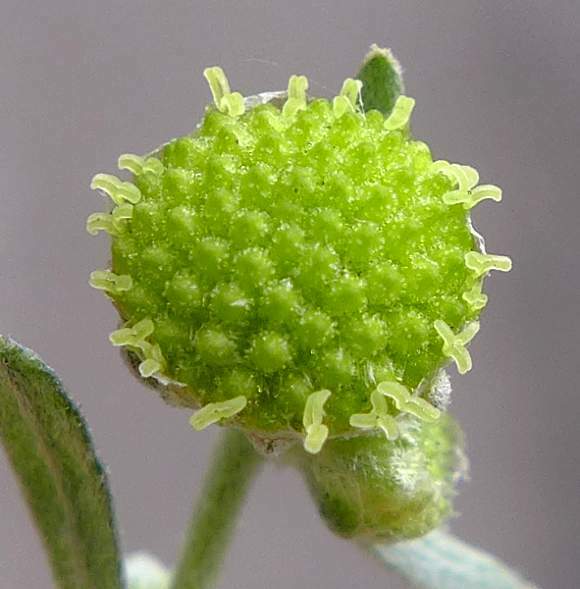 The inflorescence is circular with many yellowish green disc florets packed together in a shallow cup. Inflorescence 3 to 5mm diameter, thickness shorter than diameter. Stems slightly ribbed, the matted hairs hiding most of the grooves apart from in this photo. The outermost disc florets have 2 visible curved pale translucent-green stigmas and are obviously female. The inner florets are bisexual. The pairs of stigmas have a deep cleft along the inner centre-line and reflexed outwards. 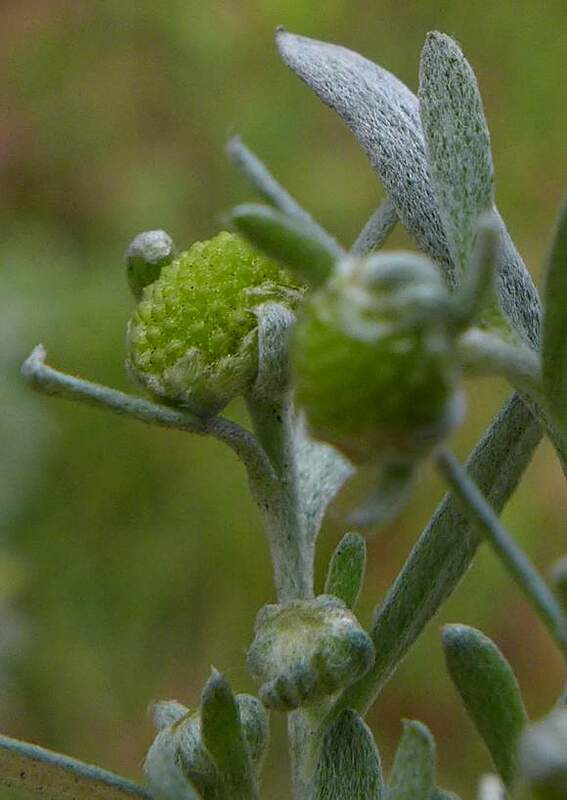 The inner bisexual disc florets haven't yet opened, they look spherical from here and are covered in tiny translucent globular protrusions. Your Author does not think this is pollen nor 5 anthers or 2 deeper-down styles (especially since it looks like they are still closed) which are much deeper down; perhaps the globules contain a resinous odourous compound of various sesquiterpenoids? 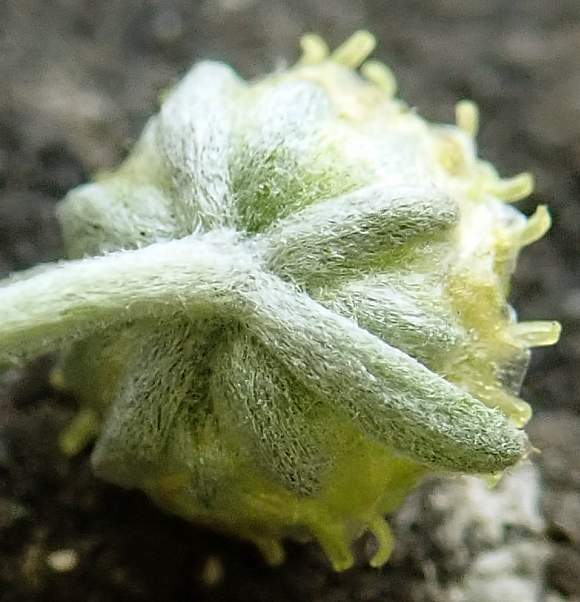 The calyx cupping the flower at the rearhas what look like an inner and an outer set of 5 sepals. 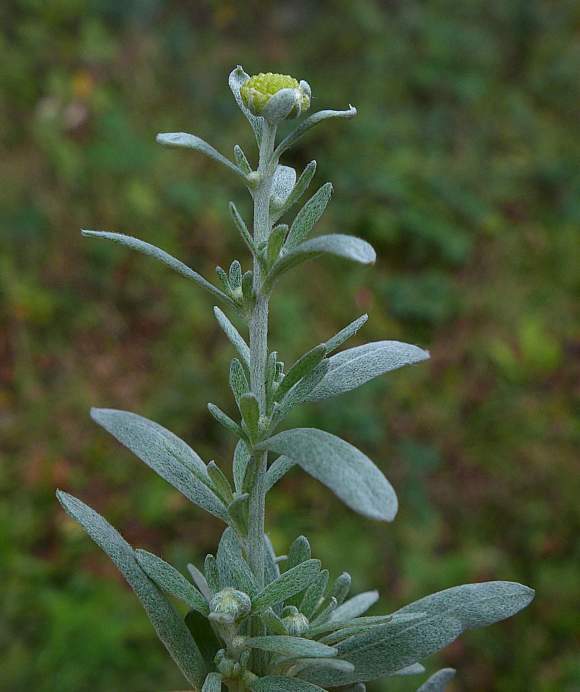 Leaves deeply lobed, leaflets rather narrow with rounded termination. 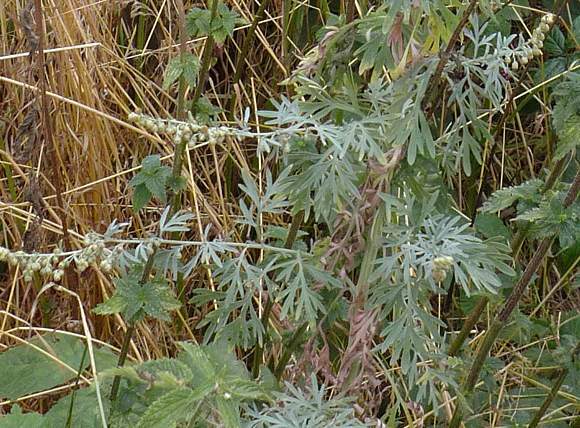 Wormwood differs from Mugwort in having blunt (rounded) leal lobes (rather than usually pointed). 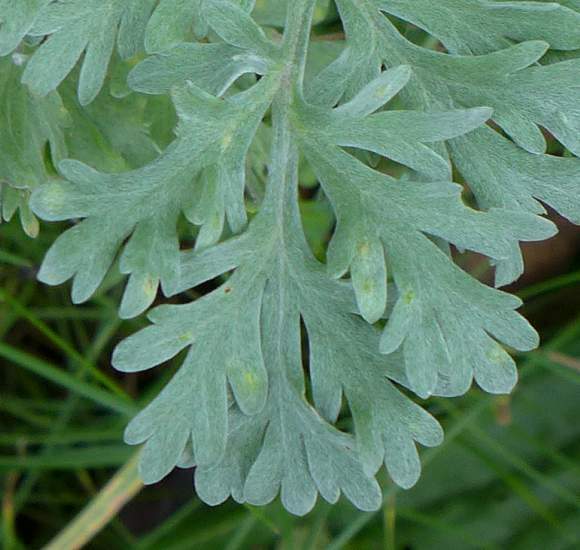 Leaves whitish green with matted hairs on their suface on both sides of the leaf [not hairless below like Mugwort leaves]. This next specimen looks rather odd with its thicker, stiff upright stance and the leaves being without lobes and mostly rounded at the end. 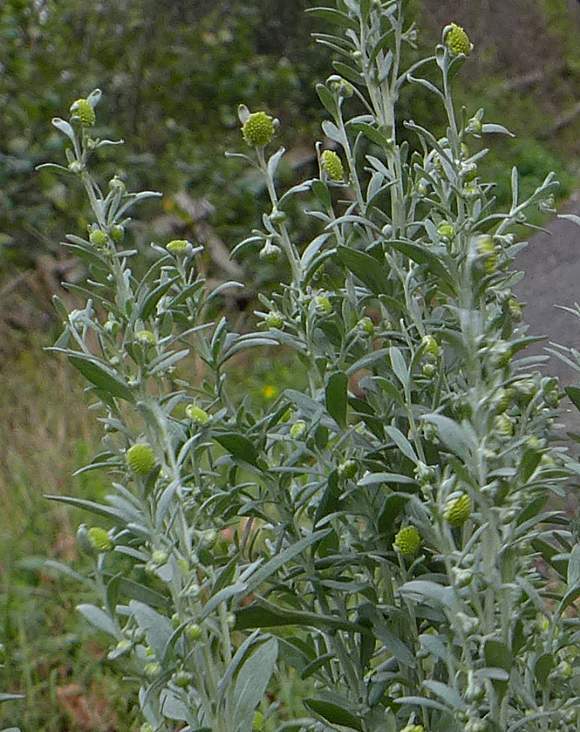 There are some suggestions it could be RUSSIAN TARRAGON (Artemisia dracunculus). But a few feet away there were new low plants which did have greyish and lobed leaves (as shown, but lacking flowers) but these basal leaves may have nothing to do with the above plant since all were more than 2 feet away from it. 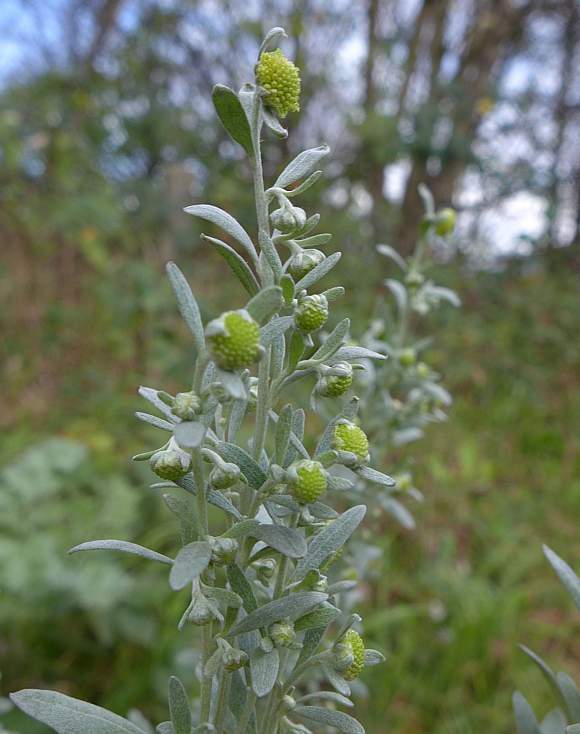 The captions beneath each photo are written as if it is Wormwood after all, but your Author can only find one other plant like this with un-lobed leaves on the internet that purports to be Wormwood. 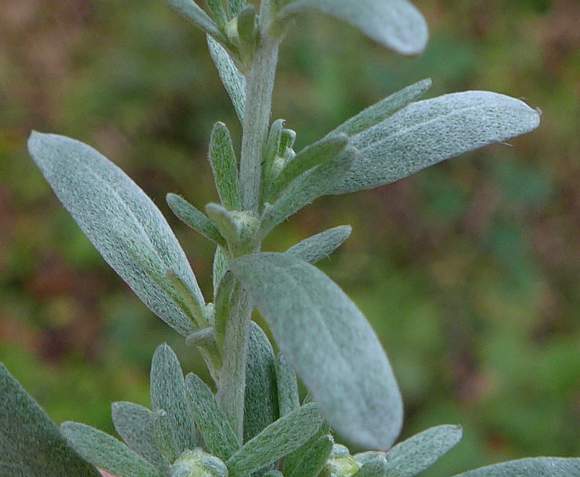 A perennial and strongly aromatic herb smelling of absinthe which grows to 1m in height. Often woody below. 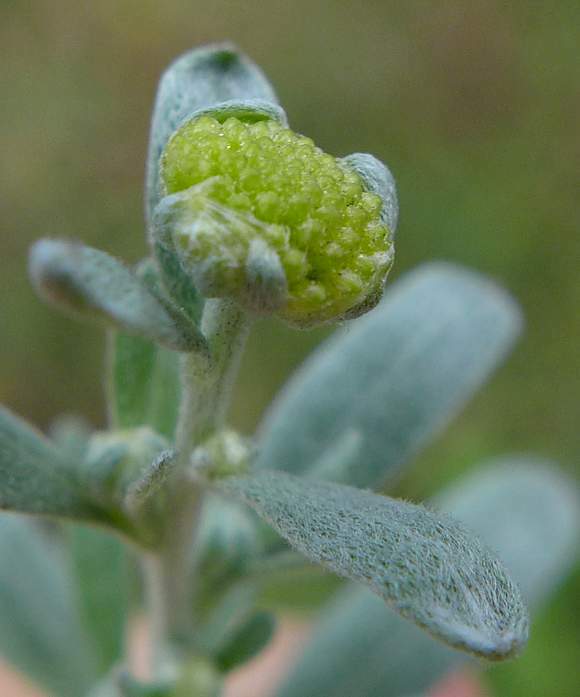 The flowers are compound and without petals, discoidal and are at first directed skywards later to point sideways then droop downwards as the flower stalks grow longer. 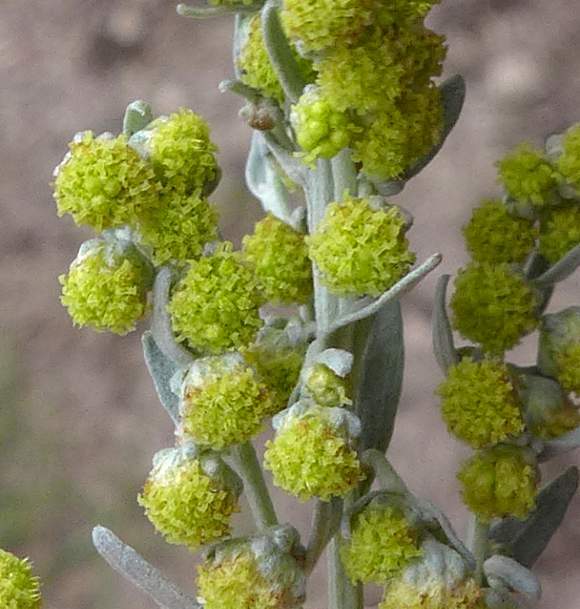 Flowers are yellow with the capitula being about 3-5mm across and un-like most other Artemesia species are of larger diameter than they are 'long'. Most leaves are toothless and lobeless (entire), upper ones usually lanceolate, lower ones have some longer more strap-shaped leaves. The whole plant is covered in silky or cottony whitish hairs, younger ones more so than older plants. Flowers yellow (these greenish because they are still young) and cupped by bracts. Flowers consist entirely of disc florets; hermaphrodite in the middle with the outer florets female. 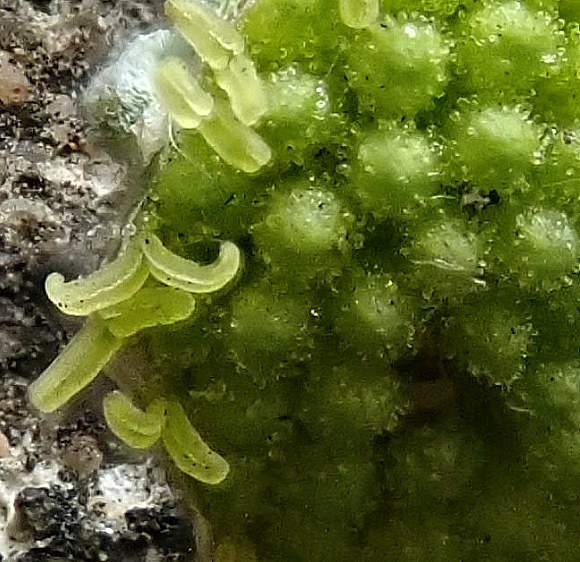 Hairs matted against surface of plant. Stems are angular or fluted. Both simple leaves and leaf segments wider than similar Mugworts and Wormwoods and are blunt at the extremity. 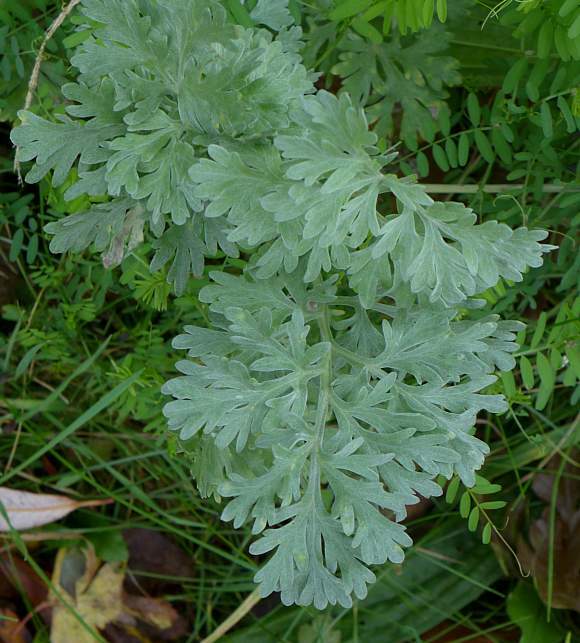 The Artemesia genus consists of several Mugworts, Wormwoods, Southernwood and the spice Tarragon, with most being aromatic. Many are very similar to one another. Not to be confused with : Woodworm, a 'worm' which bores holes in (usually dead) trees and wood. Like Tansy (Tanacetum vulgare) it has discoidal flowers which are similarly aromatic (although not smelling of absinthe), yellow and consist solely of disc-florets - but they are much wider at 6-10mm across and the leaves are feathery and finely divided similar to those of Yarrow (which has much larger flowers that also have white petals and which is also aromatic, although that smells differently to both Wormwood and Tansy). 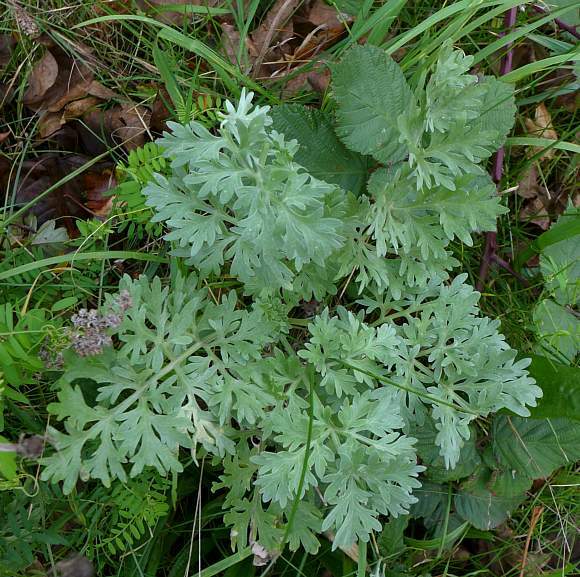 Some similarities to : Field Wormwood (Artemesia campestris ssp. campestris) since that too has yellow florets which droop downwards but they are slightly smaller (at 3-4mm across) and the plant is not aromatic. 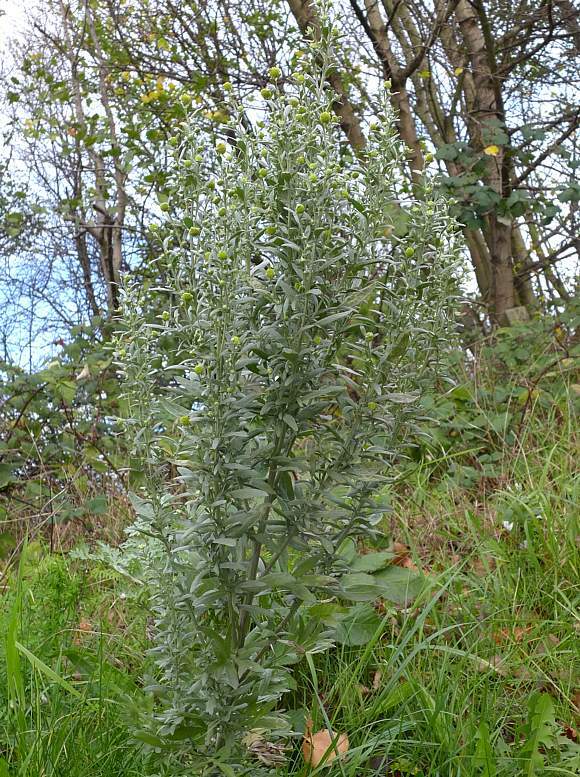 It is found by roads and heathland and is much rarer than either Wormwood or Sea Wormwood . 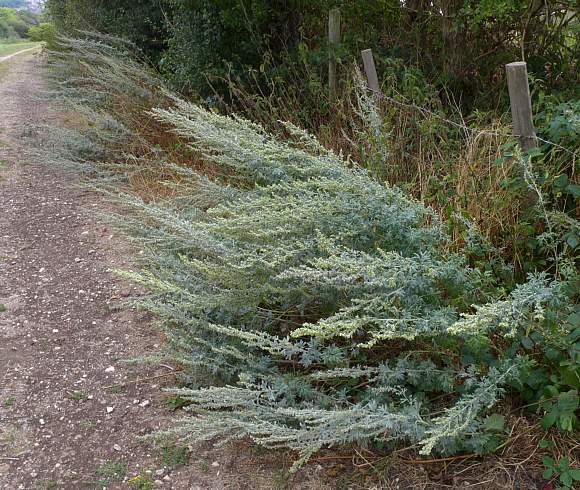 The other sub-species is Dune Wormwood (Artemisia campestris ssp. maritima which is found on sand-dunes. Both these sub-species are a very rare RRR. 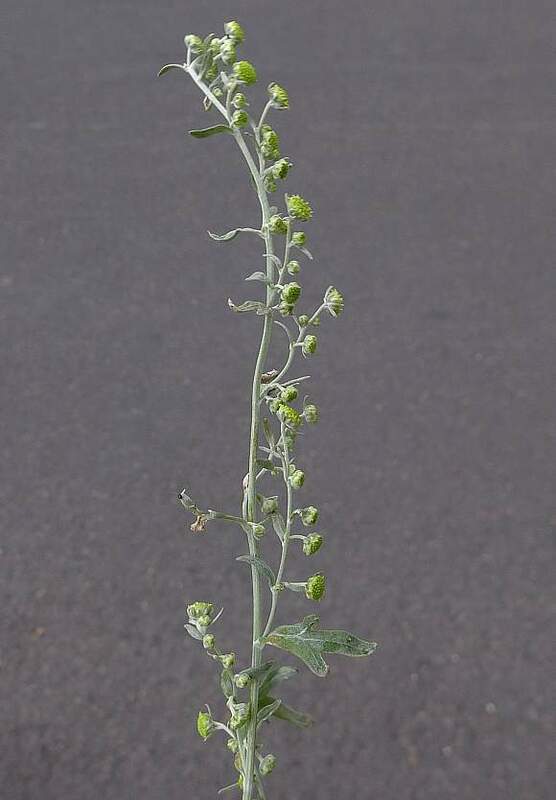 Slight resemblance to Ragweed (aka Annual Ragweed) (Ambrosia artemisiifolia) which also has downward-facing yellow discoidal flowers, but the flowering spike has a high-density of flowers which are not interspersed with leaves (or bracts). 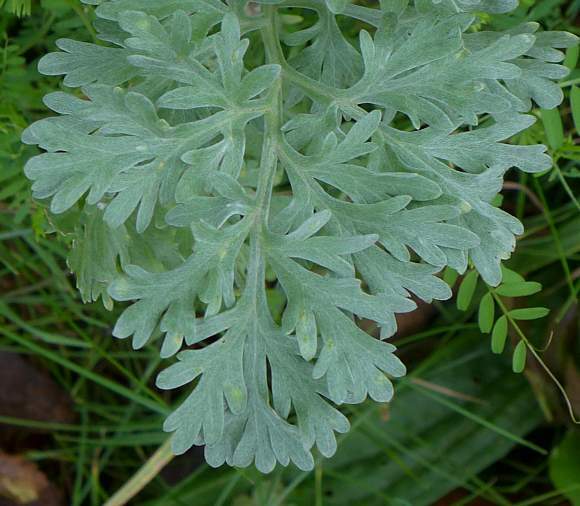 The leaves of Ragweed also look similar to those of Mugworts and Wormwoods, hence the specific epithet artemisiifolia. 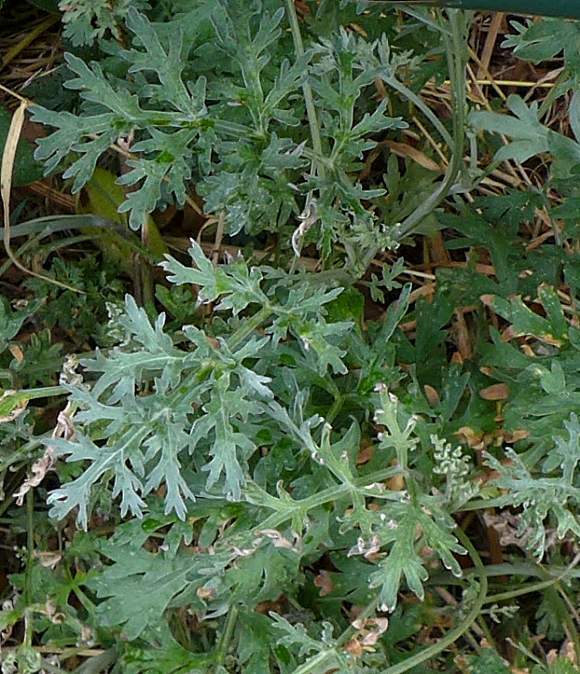 Perennial Ragweed (Ambrosia pilostachya) has a similar slight resemblance to Wormwood. 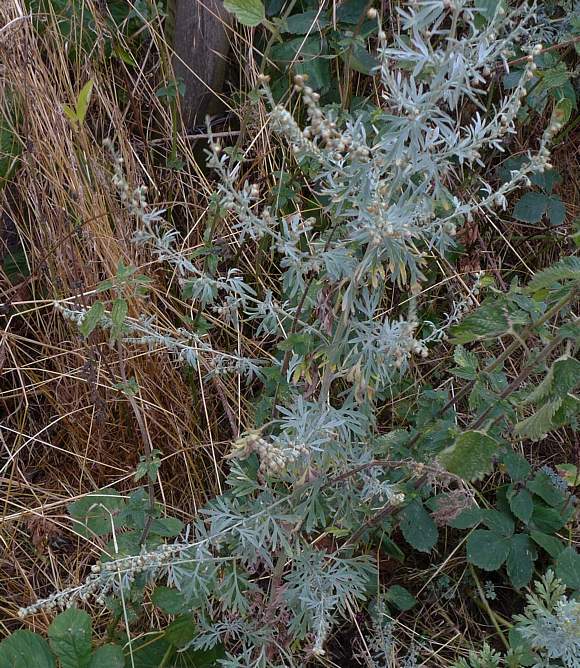 Wormwood is an archaeophyte in the UK, having naturalised many centuries ago but is native to temperate regions of Europe and Asia and also to Northern Africa growing on waste ground, gravels pits, quarries, waysides, hedge-banks and other rough ground. Seed dispersal is gravity-fed. It has a very strong aromatic small (when young) with an odour of the infamous alcoholic drink absinthe. It is also used as flavouring for some other spirits and wines such as bitters, Vermouth and Pelinkovac. In addition to the compounds depicted below, Corymbalone , δ-Verbenol , Eicosanoic Acid , Globulol , IsoGerianal , Pivalate (aka Limonen-6-ol ), Phenanthrene, Phytol and Retinol Acetate have been extracted from the above ground parts of the plant. Wormwood is dried in air first before the essential oils are extracted, which amount to anywhere between 0.1% to 1.1$ of the total mass. About 107 compounds have been identified in the oil from plants grown in various countries around Europe (hence the huge variability in composition), representing 85% of the total oil. Therefore 15% of the oil had un-identified components. The principal constituents were found to be Sabinene (at anywhere between 0.9% to 30.1%), Myrcene (0.1% - 38.9%), 1,8-Cineole (aka Eucalyptol 0.1% - 18%), Artemesia Ketone (0 - 14.9%), Linalool plus α-Thujone (1.1% - 10.9%), β-Thujone (1.1% - 64.6%%), trans- EpoxyOcimene (0.1% - 59.7%), trans-Verbenol (0 - 11.7%), Carvone (0 - 18.5%), (E)- Sabinyl Acetate (0 - 70.5%), Curcumene (0 - 7.0%), Neryl Butyrate (0.1% - 13.9%), Neryl 2-MethylButyrate (0.1% - 13.9%), Neryl 2-MethylButanoate (0.1% - 9.2%), Neryl 3-MethylButanoate (0.4% - 7.3%), Chamazulene (0 - 6.6%). There were a great number of other more minor constituents that were identified amongst them Chrysanthenyl Acetate, Aromadendrene (0 - 0.4%), Bisabolol (0 - 7.5%) found in German Chamomile (Matricaria recutita), Ledol (0 - 0.6%) which is a poisonous sesquiterpene found in the non-native Bog Labrador Tea (Rhododendron groenlandicum) and two other Species of Rhododendron and which can cause cramp, paralysis and delirium. 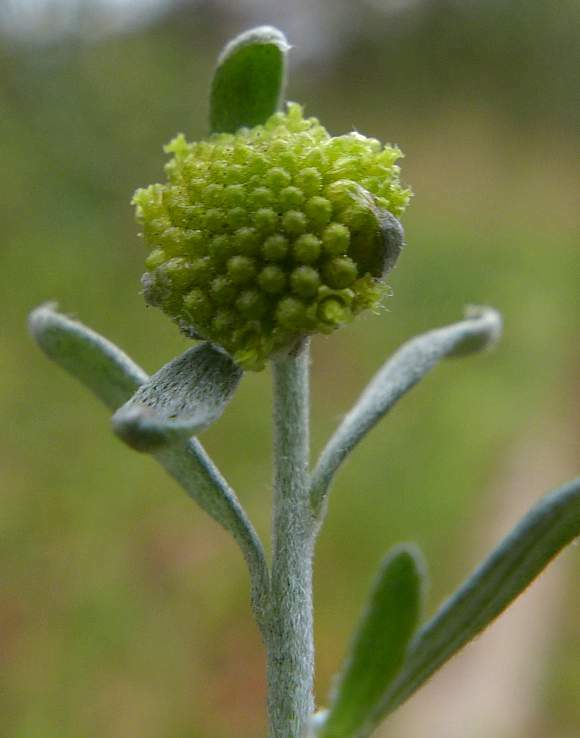 The huge variation in concentration of the secondary metabolites not only depends upon where in the World the Wormwood was growing, but also on the growing conditions it has experienced - such as sunlight, water, temperature, and any other forms of stress that the plant may have experienced such as attempted invasion by parasites such as fungi or other organisms. Moreover, the time of year it was harvested, whether nascent, mid-season or near the end-of-season. It is the Thujones in the oil which are the most toxic part if used for making Absinthe; they are neurotoxic and cause disturbances to the Central Nervous System which can lead to convulsions, kidney failure, epileptic seizures, long-lasting psychiatric disturbances and ultimately perhaps even death with a sufficiently large dose. 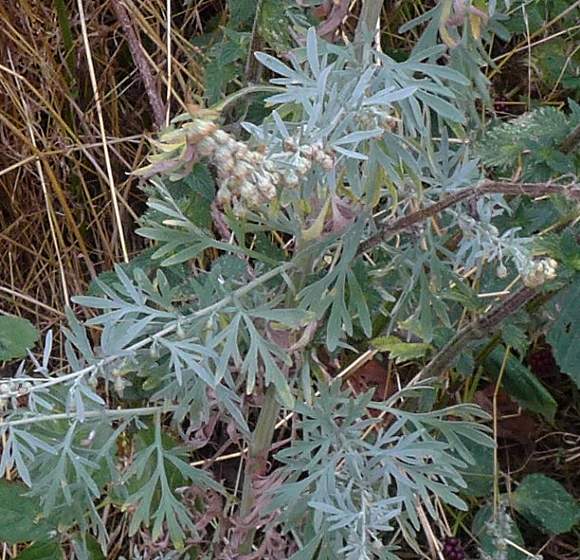 Thus Wormwood used for Absinthe must have low levels of these Thujones, but that was not appreciated until fairly recently. Absinthe has been banned in several countries because of its toxicity, but it is now making a comeback providing that any thujones present are at a very low level. The Chamazulene also exhibits toxicity. 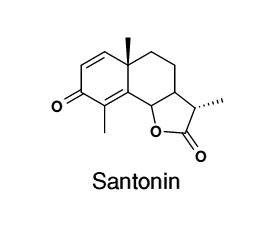 Santonin was used pharmaceutically as an anthelmintic - to treat parasitic worms, but has fallen out of favour in many countries for safer alternatives. 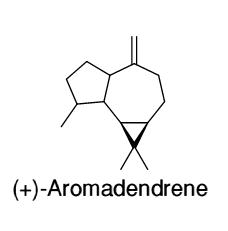 It has structural similarities to Parthenolide which is found in Feverfew. 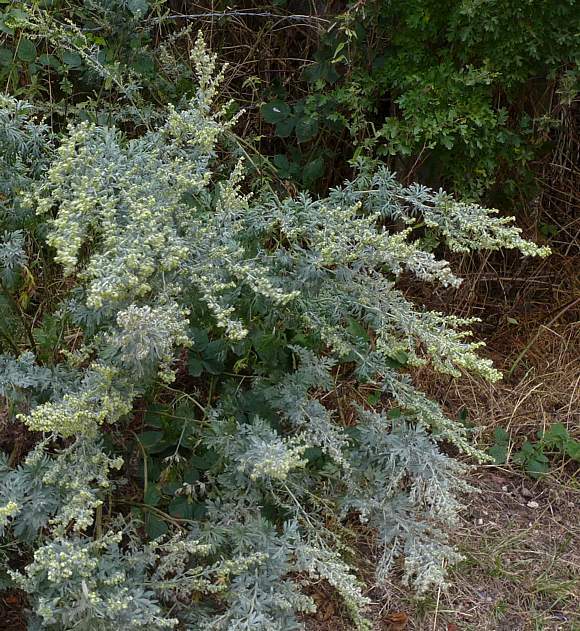 Although present in Wormwood it was/is obtained at higher concentrations from the flowerheads of the non-native variety of Sea Wormwood (Artemisia maritima) called Artemisia maritima var. stechmanniana. 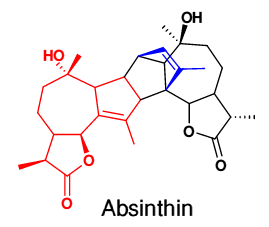 Artabsin, which has similarities to Lactucin, is another sesquiterpene lactone contained in the volatile oil of Wormwood and is the monomer of Absinthin shown below. Absinthin tastes extremely bitter and is responsible for the distinctive taste of the infamous alcoholic beverage called Absinthe. Notice that Absinthin consists of two identical parts (one part shown in red), with an extra add-on, and is in fact the result of a dimerization process which takes place within the plant. Note that the end result, Absinthin, is not a true dimer because an extra out-of-plane bridge has been added (shown in blue). 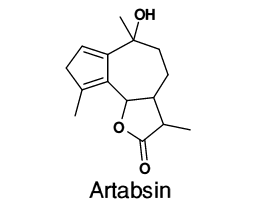 Before dimerization, the two individual units were Artabsin, shown above. Artemisinin is one of a family of drugs used to treat Malaria which is caused by the parasitic organism Plasmodium falciparum and spread by some mosquitoes in tropical climates. 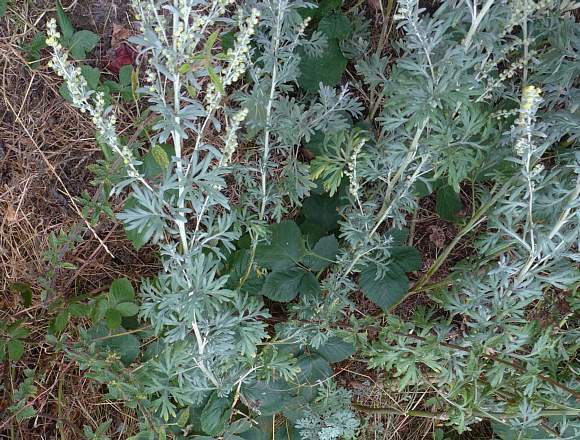 It is obtained from Sweet Wormwood (Artemisia annua), a non-native plant which yields the compound in higher quantities more reliably than does Wormwood itself. Artemisinin is a sesquiterpene lactone - but one with an extra and highly unusual (in natural compounds) peroxide bridge ( -O-O- ), which is believed responsible for the drugs potency against the malaria parasite. Use of this compound alone to treat malaria is discouraged because it seems to easily induce drug-resistance; it being far more effective to attack the malaria parasite with a cocktail of differing compounds at once. To this end a series of artificially produced analogues of Artemisinin have been produced synthetically, but the high cost of chemical synthesis of both artemisinin itself and of other similar intricate compounds is limiting its global use. Huge strides have been made in greatly reducing the occurrence of malaria in some parts of the World, but a great deal more effort must be expended to eliminate malaria from the World. A genetically engineered yeast has been made which will synthesize Artemisinic Acid which greatly simplifies the synthesis of Artemisinin and other Artemisinin derivatives, such as Artesunate , Artemether , DihydroArtemisinin , Artelinic Acid and Artemotil , all of which possess the active peroxide bridge across an Oxepane moiety (the fully-saturated 7-membered carbon ring possessing 6 carbon atoms and a heterocyclic oxygen atom). Other plant secondary metabolites with a peroxide bridge include Achillin found in Yarrow. Although Artemesinin and other artemesinins can be administered alone, they are usually used with other dissimilar anti-malarial drugs to prevent recurrence of parasites if administered singly. They cannot be used prophylactically (to prevent infection) because their half-life within the body is short; only for treating malaria once caught. The World Health Authority recommends the administration of Artemisinin Combination Therapies (ACT), where Artemisinins are used in combination with dissimilar partner drugs possessing much longer half-lives, such as Amodiaquine , Lumefantrine , Mefloquine , Piperaquine or Pyronaridine - all synthetic drugs and all of which contain one or more halogen atoms such as fluorine or chlorine which are very rare (chlorine) or virtually absent (fluorine) in biologically produced substances. But it is most important for those under treatment to take the full prescribed treatment rather than stopping when the symptoms subside; some remnants may linger. 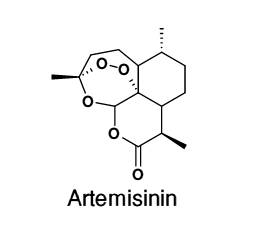 Artemisinins are also effective against parasitic worms and can be used as an anthelmintic for Schistosomiasis, a tropical disease spread by freshwater snails which contaminate the water by releasing parasitic worms whereupon they bore into human flesh as folk (mainly children) play or wash in the parasitised rivers. Artemisinin is also effective against a wide variety of cancers, and is a very effective treatment for leukaemia and colon cancer, less so for melanoma, breast, ovarian, prostate, central nervous system or renal cancers.